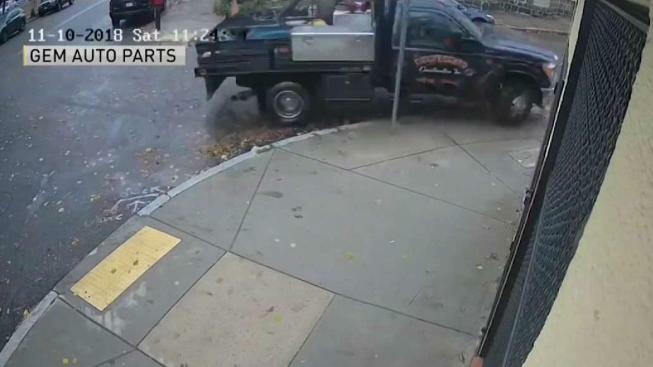 Surveillance video shows the aftermath of an incident in which a man allegedly stole a truck and nearly hit two police officers in Boston. Police say two officers were injured, and one was nearly killed, after a man stole a truck from a Boston construction site this weekend and took off. Robert Bjorkman of Middleborough, Massachusetts, is accused of stealing the truck around 11:30 a.m. Saturday from a construction company on Columbia Road. A Boston Police officer tried to pull him over, but he failed to make a stop. Instead, Bjorkman allegedly went through a set of lights and sideswiped a car. He then allegedly struck another vehicle and backed up into an officer's cruiser. Police say Bjorkman finally stopped at the intersection of Boston Street and Mount Vernon Street, where an officer approached him on foot. In paperwork that was submitted in court Tuesday, a police officer described what happened next. "I instructed the operator to put the car in park and turn off the engine, he did not comply with my instructions, and instead began to drive away," the officer wrote. "I was forced to step onto the running boards and as I did the suspect continued to drive, while I was clinging onto the side of the vehicle. While hanging onto the vehicle with my left hand, I struck the suspect two times in the fact and then fall violently to the ground landing with my lower extremities under the vehicle just behind the front wheel. "While under the vehicle I heard the sound of the back-up alarm, as the driver shifted into reverse, I rolled out from under the vehicle just as he backed up onto Boston Street, in fear for my life I drew my department issues firearm and pointed it at the suspect and gave him several verbal commands to stop the vehicle. The suspect took aim and drove directly at me striking me with the front of his vehicle causing me to leave my feet and throwing me backwards several feet landing on the sidewalk." Bjorkman faces 10 different charges, including assault to murder. He's due back in court for a dangerousness hearing on Nov. 27.